Sorry been a little lazy with posting, have been taking full advantage of the lovelier summer. This has included fruit and veg picking in the country side, going to lavender fields, growing avocados, and some flying trapeze as well as just sitting in sun in a pub garden. 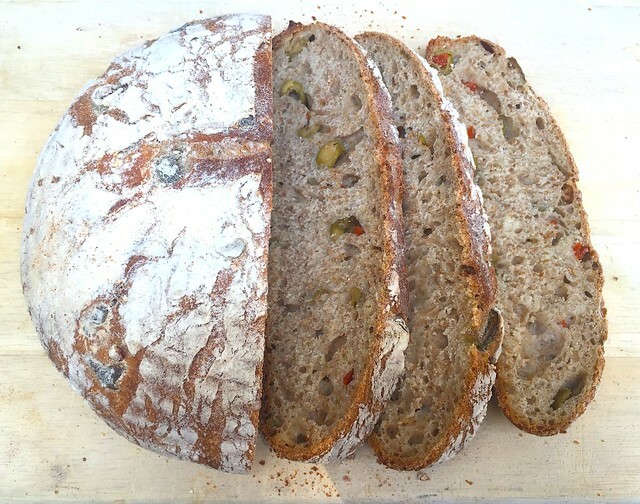 But here is the no knead version of my precious olive bread recipe. Came out very well with a nice crumb. The bit of red is because I use the Waitrose stuffed green olive but you can use normal black or green olives. Fold 6 times every 20 min. When folding use olive oil on your hands not only moisturise the hands but also keeps the dough from sticking. Folding and proofing – divide the dough in two and shape two balls. Let it proof for about 20 hours in the fridge. Final bulk rise – take out the dough out of the fridge and at room temperature for about 2 hours. Preheat the oven at 260C˚ the Dutch Oven(I have a Le Creuset pot). Slash the top and Bake at 260C˚ for about 20mins with the lid on. Lower the temperature to 190C˚ for another 30min. Take it out of the oven and let cool for a couple hours. Mincemeat​ – Christmas is coming!